I added my first Marvel Comics title to my comic book pull list today – Captain Marvel. The “new” Captain Marvel is the former “Ms. 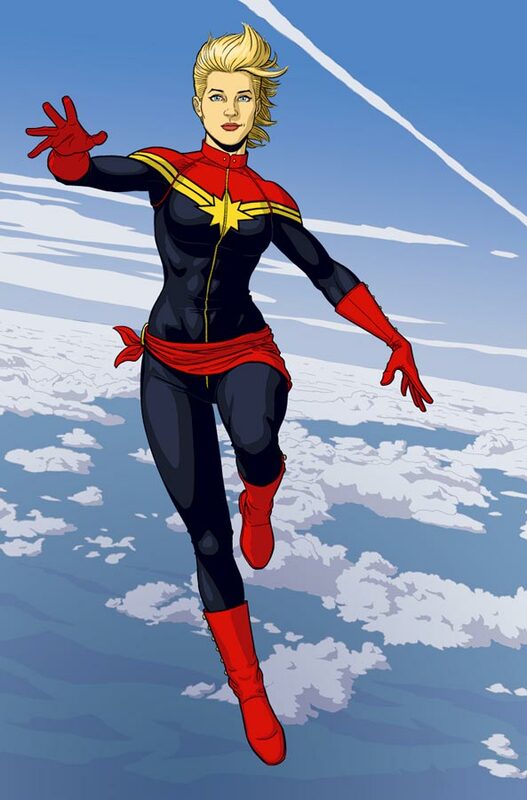 Marvel” — Carol Danvers the female adjunct to Captain Marvel from the old comics, before he died. She’s had a comic for years, but Marvel has reworked her costume and has her taking over the title of “Captain” in this new series. The story is not too bad; a little heavy on the overt “girl power!” charge at the beginning of the book; with the villain taunting Danvers with sexist remarks while she and Captain America battle him, and of course she wins the day, because “girls are awesome! I thought none of that really needed to be said, but the rest of the story was great, with Danvers working through her reluctance to take on the title of “Captain” from her old friend and mentor. And hands down, the new costume is my favorite superhero costume ever, knocking my former favorite – Captain America – into the dust. It’s pretty damned awesome. I love it so much, I made a t-shirt design inspired by it, that you can buy at this link on Red Bubble. Unfortunately, they made me take the design down.